Silent Days. Jaydeep Sarangi. Allahabad: Cyberwit.Net. 2013. ISBN: 978-81-8253-396-7. Pp68. Price: Rs. 200/-. Print. There are times when days fall silent and they speak through a vibrating silence − like a cell-phone kept on silent mode but vibrating at the incoming calls. It is up to the receiver to accept the call/s or reject them, depending on the context and the caller ID. In case of a poet − especially versatile Jaydeep sarangi with increasing global visibility and credibility as a thinker-poet and critic − the temptation to let go by such silent alerts is difficult and despite being busy with a thousand of mundane jobs that we all are condemned to execute Sisyphus-like in our post-modern, one-dimensional, everyday existence on a degrading planet, we latch on to such fleeting moments and snatches of conversations. Jaydeep Sarangi − JS to close friends − does that precisely. Working multiple roles as an essayist, critic, editor, traveler, writer, poet, reviewer, interviewer, teacher, mentor and friend, the man from Dublong to Beas does another literary feat at a high-altitude and conducts us to a rarefied field − perhaps at 50,000-feet above earth-level where sound-barriers are breached by a soaring mind of a poet in a trance and entering a different realm visited by the early Greeks and Shakespeare, among a notable number of astral visitors from the terra firma − of communing with life! His slim collection called teasingly Silent days captures the days falling silent and interacting with a hungry poetic soul in a gentle absence − the verbal lack. The clarifying non-verbal spaces were/ are glimpsed by the meditating monks. He plumbs and probes those inner depths of everyday realities, the angst of our middle-class urban existence, the value of non-verbal communication, delight of pursuing arts and the overall meaning of being alive in a stressful moment of history searching for ideals, and brings up pearls from such expeditions to those dim regions. And what makes you weep. Here you can hear a post-colonial critic of repute translating the dynamics of that complex of ideas into a flow simple, yet powerful, like the waves of the Beas. The role of a poet is also carefully undermined by claiming the inability/unwillingness to know the reasons for the alienation of Indian youth and a claim to represent their pain/angst/anger causing tears from a cultivated distance through re-constructions of flimsy history. The coinage of the term indigenous ink is striking − IWE (Indian Writing in English) − is doing that only: Crafting, re-creating, re-imagining/re-presenting Indian experience in an alien medium, a colonial language lovingly preserved and promoted in a big way in a free country, as a heirloom. This kind of subtle de-construction and critique can come from a powerful mind engaged with theory at the highest plane only and you get reminded of Eliot as a poet-critic. It is the old attire, I touch with a pen. Here, the native/alien binary is hinted and re-formulated expertly in a new combination, recalling the famous Barthesian assertion that all writing ultimately becomes a rich tissue of quotations, a thing that refers back to others in a kind of intertextuality, in an age of intersecting intellectual grids and borderless conversations and exchange of trans-national ideas. Writing in another language is an eclectic act in itself and very delicate one. Native experiences and heritage get expressed in anther idiom and JS, an expert craftsman, does that act with the élan of a connoisseur. While reading these poems, I felt like travelling back to a country road that I often take to my office in suburban Mumbai. It is a long winding road nestling among trees and cutting through a small river gurgling its way to sea. It lies stretched between two national highways and is a short-cut. While travelling through this green zone I understand the meaning of inner/outer solitude for a fevered urban mind. For the ‘natives’ living there in the little villages in the shadows of hills, it is a natural state of being. For an ‘alien/outsider’, it is a transient state of rare silence that soothes so much − like the aanchal of an old mother. JS is successful in re-creating that elusive mood, that mysterious moment, that strange tranquility you feel while going on a country road or watching a sun-up or a Gauguin, up close. He catches the strains that can be heard only when days suddenly become quiet and one goes inside one’s personality to fathom the inner riches stored for us all. His poems inaugurate a New Movement in IWE. A major poet is born! Silent Days vociferously proclaim the arrival of a genius! by Prof. Dr. Sunil Sharma Silent Days. 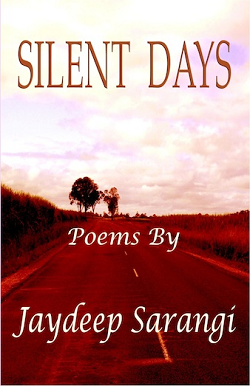 Jaydeep Sarangi. Allahabad: Cyberwit.Net. 2013.